Greener is better, especially in the eyes of today’s consumers. Many businesses today have taken the stance that becoming a greener, more eco-friendly organization is pivotal from a moral standpoint. These businesses also realize that by making genuine efforts to reduce waste, consumption, or emissions, you stand to attract a whole new audience and even increase your profit margins. Studies suggest that over half (53%) of today’s consumers prefer shopping with businesses that boast a green brand reputation. 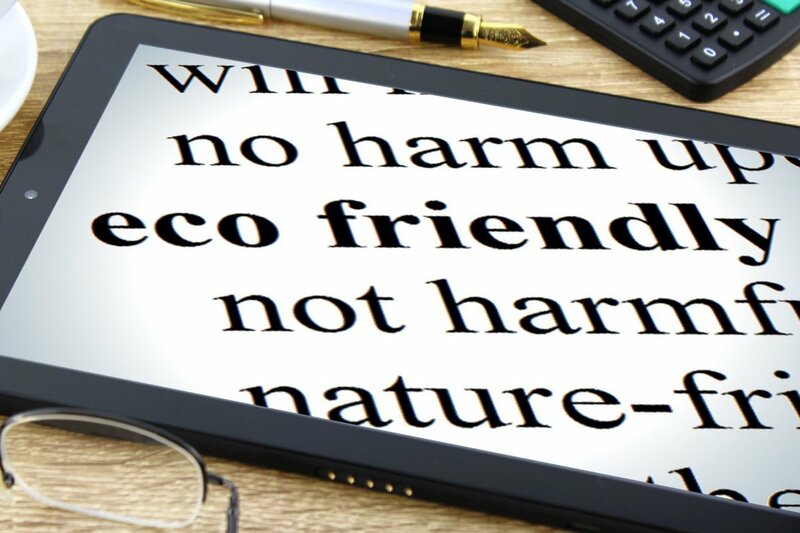 Today’s average web surfing consumer is eco-conscious and far more likely to connect with brands that share the same values. In short, being a greener business – and shouting about it from the rooftops – could significantly boost your commercial prospects. You’ll feel good about helping the planet, too. Here, we explore ways you can become a greener business and market your new eco-friendly initiatives to a potentially loyal, lucrative target audience. The rate of environmental damage is rising across the planet, but we still have a chance to reverse some of these issues. As a business owner, it’s important to do your bit to ‘go green’ if you can and here’s the great part: being more eco-friendly will ultimately help save your business money. By investing in reusable products (for example, reusable bags containers and packing as well as bamboo cutlery and cups for the kitchen rather than single-use paper or plastic alternatives), you will reduce your outgoings over time by eliminating the need to rebuy items and inventory. Moreover, by going paperless, you won’t have to purchase any printer paper and by reducing water as well as energy consumption you will reduce your utility bills quite significantly. There are many ways you can make your business greener and by doing so, you will save money. A recent sustainability report discovered that 66% of people are willing to pay more for sustainable goods. Moreover, 82% of adults believe they’re well-informed about brands with a solid track record for sustainability. As more people begin to play their part in creating a greener, more sustainable future, a wealth of eco-friendly trends and activities are emerging constantly – initiatives that you can leverage to your advantage. Not only does this new activity offer prime promotional opportunities for your business, but by communicating a greener brand message to your customers, you will remain relevant, foster more brand loyalty, and tap into one of the world’s fastest-growing markets. Today’s millennial generation sees sustainable shopping as a major priority. As this cohort alone makes up a significant segment of today’s eCommerce shoppers, appealing to these “green-minded” digital natives will significantly boost your bottom line. Encourage staff members who live nearby to carpool, cycle, or hop on public transport by offering incentives. This will help reduce emissions while giving you the scope to create some engaging behind-the-scenes blog or social content that appeals to eco-conscious millennials. Use alternative energy sources to power your business. If possible, install solar panels. If that’s not practical, choose an energy provider that gets their power from renewable sources. Source your internal goods (from kitchen supplies to office equipment and cleaning products) from other green, sustainable businesses. Many used electronic items end up in a landfill. If you can, donate them to charities or schools or get in touch with organizations like Recycle Now that can take them off your hands and dispose of them properly. Conserve water and reduce your single-use plastic consumption (for starters, try sustainable packaging materials to send out your products) across the business, encouraging employee buy-in by making these new initiatives as easy as possible to implement. Go paperless as much as possible, using electronic communications, documents, and invoices where appropriate. These efforts alone will make your business significantly greener and give you plenty to shout about – which brings us onto our next subject. Once you’ve put your new green initiatives into place, you should share your new eco-conscious ideals with your target audience. Here are four key approaches you can take to help you market your new, greener activities. The first thing you need to do is revisit your core brand messaging. Explore your golden circle (your “what,” “how,” and “why?”) and consider how you can tweak your existing communications to share your exciting new eco-messaging with existing customers as well as new prospects. Stand tall with all of your newfound values and make sure that you explain them to your audience through your brand messaging. One way of getting to the heart of your brand messaging is by creating a brand story that gets results. You can achieve this by recrafting your “about us” page, using this content as the foundation for all of your other business campaigns and communications. As mentioned, this seismic consumer shift toward sustainable living has spawned its fair share of trends and activities – particularly through social media. Remaining up-to-date with activities, social media trends, and hashtags surrounding plastic consumption, pollution, emissions, packaging, products, and activities will allow you to leverage them to your advantage. If you explore the latest trends and hashtags that are relevant to your eCommerce business niche or industry, you’ll be able to craft engaging, relevant content that resonates with these audiences while sparking up meaningful conversations that could result in conversions. Moreover, by launching your own social media-based trends or campaigns that cut through the noise, you stand to boost your brand awareness exponentially. Take Johnson & Johnson, for instance. An eco-conscious brand and an early adopter of green brand marketing, in 2013 Johnson & Johnson paved the way for many of its peers by launching a Tumblr campaign urging consumers to be more mindful about recycling. By building an entire Tumblr-hosted microsite dedicated to bathroom product-based recycling and mindfulness tips, this engaging, inspiring work of green content marketing is still widely used today. By creating a buzz around the Tumblr campaign through its most subscribed social media sites (including Facebook and Twitter), the brand generated a great deal of traction. This socially-driven initiative positioned Johnson & Johnson as an industry thought-leader, and the campaign’s hashtag is still actively used by eco-conscious consumers in 2019. A testament to the enduring power of social media. Influencer marketing is a powerful way of sharing your brand messaging and eco-friendly products or processes with a wider audience. At present, 70% of young consumers trust influencers more than traditional celebrities. Creating shareworthy eco-based content such as blog articles, infographics, and videos as well as using niche influencers to promote it (and your products) has the potential to grow your business substantially. In today’s hyper-connected world, there are thousands of well-subscribed digital influencers covering just about every facet of greener living imaginable. Reaching out to the right influencers and forging a meaningful, mutually-beneficial working relationship can help you make your efforts known. You can create inspiring collaborative content or ask the influencer to review your latest products or initiatives, sharing their thoughts with their growing following. As a result, your green brand reputation will become firmly cemented as your audience grows. It’s one thing talking about being green, but sometimes, actions do speak louder than words. By hosting a gathering or event, you will be able to share your newfound values with a highly-engaged audience and encourage lifelong brand loyalty. Host an eco-friendly pop-up market and invite other green businesses in your area to participate. Organize a plastic cleanup or litter pick in your locale or wider area. Set up an event with food, drinks, and keynote eco-friendly speakers, inviting existing customers to come along and enjoy for free. Hold a product launch and invite customers, influencers, and the press to get up and personal with your new greener processes. All of these events offer invaluable opportunities to create inspiring behind-the-scenes content that you can promote with your target audience through social media. Get planning! Becoming a greener business will be one of the most rewarding and valuable things you will ever do. Heed this message today, and you will reap amazing rewards tomorrow, both for your business and the planet. For more eCommerce inspiration for the coming year and beyond, explore our guide on using traditional media to cut through the noise in 2019.